I think that my kids team is moving forward at a very serious pace at the moment. Latest, they demolished almost all opponents at a tournament in Sweden and impressed me very much. I have spend the last 5-6 years experimenting with how to design my kids classes in the best possible way, and I think I have finally settled on my solution now. I have been running my current method of teaching with them for about a year now, and the results have been phenomenal. They are taking home tons of medals, and I really see them improve and mature technically and socially as a team. Competed again: Two submissions & one popped knee. Another competition was coming up and I thought it looked interesting, so I decided to sign up even though I still had not been able to train due to my elbow injury. 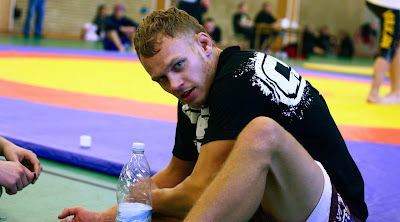 It has been two months now, where I only managed to compete in Germany and have maybe 4-5 rounds of sparring the following week (which made my injury much worse). I thought my arm was feeling pretty good (maybe around 75%), and since this event would guarantee me at least 3-5 matches, I thought the experience would be worth more than the slight risk of injuring my arm again. In this tournament, there is no points, only submission or draw. Since I had no preparation for this event whatsoever, once again, I had to be very aware of my cardio. I didn't make a specific gameplan this time, other than really focusing on relaxing and treating the matches as any other saturday roll in the gym. Also, I wanted to get a chance to try out my deep butterfly halfguard game a little more, since I am working intensively on polishing this. I am planning on making an instructional video on this when I am "done", since I really feel that is has revolutionized my offensive guardgame. Anyways, I ended up having three matches, since we were only four people showing up that day. I was competing in the -77 kg advanced, and I felt really comfortable in that weight, even though I have not been doing any physical training for two months. I think it will be my preferred competition weight in the future. Overall, I was pretty pleased with my performance. I won two by submission and had one draw. I had the chance to try out my deep butterfly half game a few times and it worked flawlessly, both for setting up submissions and sweeps. Ofcourse, there is the factor that not many people recognize this position and then don't know what to do from there, but also it is a solid way to actively break guard posture before going for submission or sweep. My cardio was pushed, but I managed to stay relaxed so that was pretty good. While I think my performance was good, unfortunately I popped my knee in the first match, when doing the calf cruncher submission. It made a nasty sound, but didn't feel too bad, so I decided to do the last two matches anyway. Probably shouldn't have done that ;) The knee hurts pretty bad now, but it is not really swollen so I don't think it is too bad, so I'll give it a week or so and see how it feels. My only concern is getting ready for the Gracie Invitational in London in a month and a half. This guy felt like he had a very slick technical game, so I wanted to focus on just keeping my base and don't get caught up in any fancy stuff that I didn't know about. I started out by pulling butterfly guard to go for butterfly half, but his feet were right there for the sweep so I went for that instead. 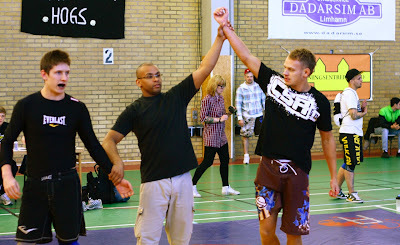 When I got on top, I instinctually went for the heelhook position. I also use this a lot to sweep from or to get the toehold/ancle lock, but I forgot to grab the foot the right way before I went for the position, so that failed and I had to bail on the position. Probably would have helped with some sparring, where I had practiced going for the other submissions in the heelhook position. At one point I tried my high crotch takedown, but seems like I missed the grip on his hip with my right hand to finish, and he managed to get the underhook and reverse. Nice and basic move, I should be more aware of this in the future if I get stuck low with the single. I know this opponent very well, since we trained together many years ago, and he is now a very experienced competitor and pro MMA fighter. Very strong and explosive for his weight, so I was puzzled on how to handle him in the match. I decided to just go with the flow and see if I could catch him in my guard even though I many times have seem him staying far away from engaging in the guard top. I managed to take him down once with an armdrag single, but he scrambled up very nicely. A few times I pulled guard, but didn't managed to get him to engage. Finally, he took me down and I managed to escape with a not so pretty, but functioning stiff-arm escape (thanks, 100 sidecontrol escapes project ;)). So pretty even match, and I was pleased with holding my own against this very game opponent. Knew nothing about this guy, but he seemed strong and tall. Kept his elbows very tight, so I ditched the idea of clinching and pulled guard instead when he went for a standing guilloutine. Went straight for my deep butterfly half and got the sweep pretty easily. I went straight for the footlock position, but once again, I didn't do it quite right, so my only option was heelhook (illegal) or bail. I swept again, this time with an armdrag, and when I passed and got on top, I was back in my good old sidecontrol series that I used a lot in another competition, and I went for the kimura but he seemed like having too strong a grip to pull it out, so switched to the armlock and got the tap.